1. Drivers that pull out in front of you and then drive slowly. 2. Drivers that don’t know how to merge. 3. Drivers that don’t pay attention to their driving. I have had so many people pull out in front of me – in parking lots and streets that do not even look my way. 4. People who talk about how “honest” they are and how they “Tell it like it is”. I have found that people that boast about their honesty and their “TellItLikeItIsness” (yes, I just made the word up) are generally bullies or just plain rude and tactless. 5. Customer service employees who treat people rudely and as if they owe us, the customers, something. You do owe us…. we pay your salaries. If we did not shop or eat in the establishment you are working in, there would be no need for your employment. I remember when the “customer was ALWAYS right”… and no the customer wasn’t always right, but we treated them that way. Those days are gone, I guess, or at least few and far between. 6. People who do not follow through. I don’t mean someone saying they will do something and then something happens that they can’t, and they let you know, and why (but it’s rare that they can’t follow through). I mean people who perpetually make promises but rarely follows through. 7. PR who think my blog is for their free advertisements (this one is blogging specific). 8. When I see kids who are disrespectful and their parents don’t say or do anything about it. 9. The overuse of #’s. Don’t get me wrong, as a blogger and social media addict lover, I hashtag. Sometimes, I could probably be accused of overusing #. I mean the people who post a photo and hashtag the heck out of it… every. single. time. they post a photo. 10. Incorrect use of your and you’re as though they were interchangeable. Check back next Sunday when the topic will be, “Describe a typical day in your current life”. We have a lot of the same pet peeves, especially PR people who think we work for free and rude customer service people. I totally agree with #4! I’m not afraid of speaking my mind about something I don’t like, but I also believe in weighing the situation and using tact. There are definitely too many #TellLikeItIs bullies! I’d say 3/4 of your list would make my list, too! My biggest pet peeve is when pr expects me to work for free, like my time isn’t valuable because I’m a mom. Last week, a pr gal reached out and asked if I can share some product information (that my readers will LOVE, not. ), and I asked for a sample or compensation. She emailed me back and said, this big magazine and this big site posted the information for free, so why should I pay you, you’re nobody. Yes, she said that. I cried all day and really felt bad because I my blog was nothing. My biggest pet peeve is people who use their cell phones and drive and those that don’t use their signals to change lanes or turn. yes, yes, yes… all of the above! I am in agreement with your list. Number 5 is a biggie. I also hate that we cannot go in and edit our own comments on blogs. I hate when I have a grammatical error and accidentally hit “enter.” I wish I could go back and correct it. I can’t stand when people swear in public with no regard to the fact there are people around them, especially small children. Let’s be clear, I swear too… but I’m always careful about where I’m doing that. Great post Donna! Hope you had a great weekend hun. Make it a great new week :). Oh my gosh, 1 and 8, YES! Great list! I agree when a car pulls out in front of you then drives -1 mph it gets annoying for sure. AND PR Thinking we work for free.. I don’t think so buddy!! Pay me like you get paid! Umm I’m thinking you are not a fan of drivers LOL. I agree with #9 (see I put # hehe) and I’m guilty of 10 all the time! This is a good list. We have a lot of the same pet peeves. All things driving related make me crazy! They are for sure my top pet peeves. I have to say I’m guilty of hashtagging my tail off on Instagram. The turn signal is one, it’s like it’s optional for some people and wasn’t even in their driving handbook! You have a lot of driving pet peeves 🙂 I do as well. I also hate the use of LOL. Did you REALLY laugh out loud? or ROFL… are you REALLY rolling on the floor? #2 is a biggie for me too! Learn to drive people! Oh my gosh, I hate when drivers pull out in front of me and then drive super slow. I agree with all of these. I actually used to be in sales and you should know how to talk to a customer. Many of those make my list too! i can’t stand thing spelled with a K when they are actually spelled with a C. Klean Klosets, Korner, etc. HATE IT. “When I see kids who are disrespectful and their parents don’t say or do anything about it” is also what I hate the most. I can’t believe there could be parents like that. You named a few of mine for sure. My other pet peeve, is people that clip their nails in public. I am not sure why this bothers me but it does. I love your pet peeves and I agreed with you especially with number 4. It’s crazy when you try to calm the person down, they’ll go wild! I agree with all of them, but I guess I am one of your pet peeves. I am very outspoken, mainly with people that I know and this is because they have wronged me so many times so I am very in their face about my true feelings so that doesn’t happen again. Yes, I am one of those annoying people that are probably someone else’s pet peeve: I hate it when someone uses poor grammar (your and you’re is a perfect example)! You’ve got a great list here and almost all of them are pet peeves of mine too. Most of your list bothers me too, but something that is annoying is when people use text speak or just change the spelling of things for no reason. Such as = c yu at dat party. OMG!!! 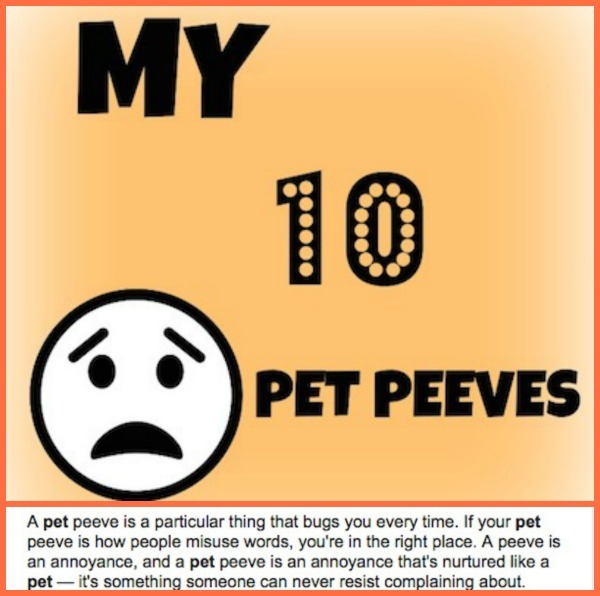 I am in complete agreement with your top 10 list of Pet Peeves! It’s amazing to find someone that is annoyed with exactly the same things as me, or you. The spelling, for me, is at the top of my list!!! I am with you on nearly each and everyone of these. Drivers are the worst. In part because their stupidity puts my life in danger. I cannot believe how many people pull out in front of me then slow, or that drive by me swerving at my car, only to see they are texting. Ugh. Oh man!! “drivers that don’t know how to merge”, how about drivers that merge at the absolute last minute lol!! Those people make me insane!! And to be honest do people really pay attention to anything anymore?!?! Its ridiculous!! I’m with you on a lot of them. My biggest pet peeve is Parents on the Cell Phone in a store with their child 3 aisle away or tearing open packages. These Parents are somewhere else and not looking out for the safety or respect of their children.